Hi friends!! My goodness, I feel like it’s been a ghost town around here, and I want to apologize for that! We had a busy Summer and getting the kids back to school! I cannot wait to get back to writing and blogging full time again!! Today, I’m sharing with you my simple, neutral Fall mantel! As you know, I am crazy about Fall!! It’s my favorite season and I adore decorating for it! The end of Summer is quickly approaching! The kids are getting ready for back-to-school and getting back into the swing of busy schedules! Why not throw a fun party before Summer’s over? Better yet, how about a tiki party? Invite your friends and family over to unwind, let loose and enjoy some of the last, long Summer nights of the season! I’ve teamed up with Wayfair to get you inspired to throw the best tiki party around!! All items included, you can purchase directly from Wayfair.com to make decorating a breeze! So let’s get to it… When a tiki party comes to mind, what kind of items do you think of? Pineapples, flamingos, tropical flowers, bright colors? All of the above here! I’ve created this super adorable inspiration board to get you excited to host your own tiki party!! The great thing about these decor items, is you can use them time and time again! The beautiful wood dining table and chairs will serve as a relaxing spot for date night, the large umbrella will cool you in the shade on those hot summer days and the pineapple tiki torches will keep the pesty mosquitos away! Don’t be afraid to purchase items for around your home for specials occasions, especially if you can use them over and over! Memories are worth the investment! So, I want to know.. What is one must-have you would include in your next tiki party? Hey friends! I’m so happy you’re here today! It felt so good to get back into working on projects and doing what I love! I had the pleasure of making over an ikea rast dresser hack! I can’t wait to share with you how it turned out! Who says you can’t take a simple ikea rast dresser and make it into your own? I’m here to show you today, just how easy it can be! Take a simple wood dresser, and turn it into your favorite piece of decor! I knew as soon as I got it, that I wanted to give it a makeover to fit in with my son’s industrial themed bedroom! I already had a design in mind, so I just went with it! The last couple of weeks have been quiet around here and I’m sorry for that! I have had somewhat of a difficult time making blogging a priority right now with everything going on. It crosses my mind almost daily, however, I’m just not 100% there to hop right back into full blown projects yet. I hope that you understand and will continue to stick around, because let’s be real… I LOVE having you here! As you may know, I have a soft spot for farmhouse signs! Today I am sharing one I made for my daughters room, and it couldn’t be any more fitting for what’s going on right now! Hi friends! I can’t believe we are already three weeks into the new year. Time is flying and I feel like I haven’t gotten much done around the house. I did push myself to put away my Winter tablescape and start with something fresh! I opted for a sweet shabby, vintage-inspired centerpiece, which is what I’m sharing with you all today! It’s hard to believe it has come and gone and it’s time for the kids to go back to school after Christmas break! It seems, after a little time off, the kids aren’t too thrilled to head back. Of course, going back to school means getting back into the routine of doing homework. My son is in the fourth grade and it can be a challenge for him to find a supplied, quite space for him to concentrate. That gave me the idea to create a fun homework station that he could call his own! Hello! I can hardly believe that this is the last few days of 2015! Wow, what a year it has been… In all honesty, one I’ve never experienced before. I wish that I could say it was all wonderful things, but I would be lying. This year, I experienced some things I never thought I would. And I hope that after all it’s said and done, that I’ve learned from them. I am eagerly looking forward to 2016! Without sounding like a negative Nancy, I would like to take a moment to mention some of the many things I AM blessed for this year… My husband, my children, my faith, my family, my friends, my home, my car, my blog and all of you! As the year comes to an end, I wanted to gather my 10 most popular posts of 2015. Do tell me though, how was your year? Hey there! I can hardly believe how quick the days are flying by.. Only two more sleeps until Christmas!! This will be my last post until after Christmas. I’m going to take some time off and enjoy the Holidays! I hope you can do the same! We will be hosting Christmas Eve dinner at our home, so I wanted to create a gorgeous centerpiece for everyone to enjoy! Today I’m going to share how to make your own DIY Winter centerpiece with fresh flowers from the grocery! 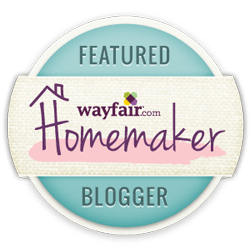 Friends, I am so excited to be apart of the Wayfair Homemakers program! It gives me the opportunity to send you directly to the source of some absolutely amazing decor for your home, as well as, share some decor inspiration with you too! With that being said, I have teamed up with Wayfair to host a housewarming party for DIY Christmas ornaments! Does it get any better? 😉 Oh, and by the way, did you get the chance to check out the adorable ornaments I shared last week?